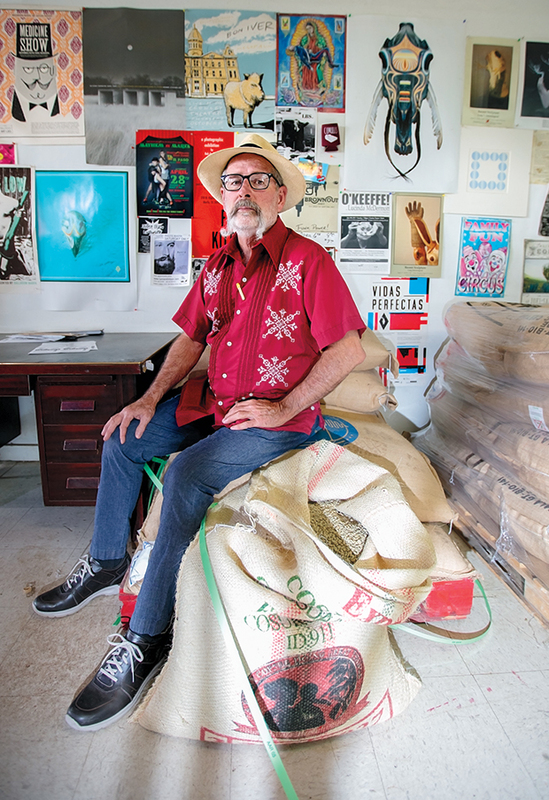 After growing coffee in Austalia for many years, Texas native Joe Williams returned to Marfa to open Big Bend Coffee Roasters. On a recent jaunt to the Davis Mountains and Big Bend area, I enjoyed drinking coffee from Big Bend Coffee Roasters in a half-dozen restaurants, coffee shops, and lodges. Finally, I decided to go straight to the source in Marfa. I passed the nondescript white building on US 90 a couple of times before owner Joe Williams came to the door to wave me down. Big Bend Coffee Roasters is at 510 W. San Antonio St. in Marfa. Call 432-729-4503. Wearing a white guayabera and Panama hat, Williams looked the part of a coffee connoisseur, and it turns out he’s been in the coffee business one way or another for some time. Born into a family that has lived in the region since the late 1800s, Williams left Texas as a young man and ended up planting coffee and grazing cattle in Australia. He returned to West Texas in the late 1980s and started running cattle here as well—but he couldn’t grow coffee beans due to the harsh topography and climate. So Williams decided to go into the roasting business instead, founding Big Bend Coffee Roasters in 2008. And while the company still operates from a former automobile shop and garage, it now supports five employees. In addition to the many establishments in surrounding counties where you can find this delicious java, you’ll also find the coffee in Dallas and Houston, as well as a growing roster of cities across the country. Williams shops for coffee beans from all over the world, buying only 100 percent organic, kosher, and certified fair trade beans, ensuring that farmers and workers receive a fair price for their products. He seeks out farmer-owned cooperatives and small family farms that use traditional artisanal methods. This attention, he believes, results in a high-quality product worth a little extra cost. Large burlap bags of fresh beans pile near the door, and bins of roasted beans line the back wall, labeled according to their origin. The heady fragrance of coffee fills the room. On one side, beneath a row of windows, sit two roasting machines, large red drums that bear a faint resemblance to small locomotives—complete with heat and steam. Four people package the coffee around a large table, pouring ground coffee and whole beans into the company’s signature silver bags, then applying labels. Neat piles of full bags grow higher and higher. Williams introduces me to his head roaster, Tyler Spurgin, a tall, bearded man who’s responsible for roasting some 4,000 pounds of beans each week. It’s no wonder he is constantly on the move. 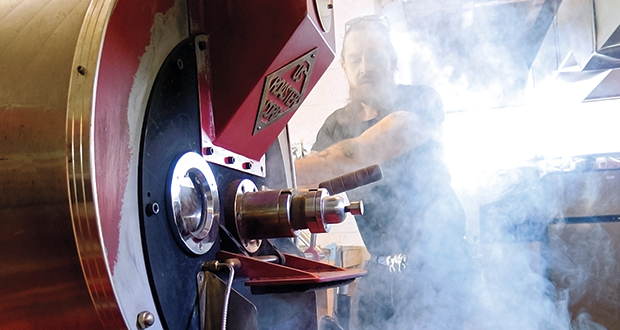 Head roaster Tyler Spurgin roasts about 4,000 pounds of coffee beans every week. He and owner Joe Williams lead afternoon tours by appointment. Williams offers tours of the facility, but he asks would-be visitors to call ahead to schedule an appointment, ideally in the afternoon to accommodate the work at the shop. Tours follow the process from raw beans through roasting and bagging, and the $20 fee includes a pound of any of his coffees. Williams and Spurgin take turns doing tours, and naturally, a pot of coffee always stands at the ready for a taste. Or, just pop in to buy bags of whole beans or ground coffee here as well as at area retailers, including The Get Go in Marfa, V6 Coffee Bar in Marathon, Porter’s in Alpine, Stone Village Market in Fort Davis, and Cottonwood General Store in Terlingua. Each month, the company donates 10 percent of sales of a particular coffee to a different charity. A blend called Dark Skies, a Vienna-style roast described as “dark, smooth, and well-rounded with memorable tastes of mocha,” benefits nearby McDonald Observatory’s Dark Skies Initiative. That effort works to reduce light pollution in West Texas to preserve the dark nights needed for astronomy research and star-viewing parties. Three times a year, the donation goes to an orphanage in Ojinaga, Mexico. 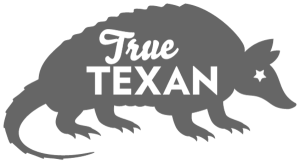 Other recipients have included a local food pantry, schools, after-school programs, and Marfa’s public radio station, KRTS. West Texas Wildfire, a bold, smooth French-roasted blend, is dedicated to firefighters who work to contain wildfires, including several that engulfed more than 300,000 West Texas acres in recent years. Other current coffee flavors include Davis Mountain Blend, a medium-bodied, honey-sweet coffee with a smooth nutty finish; and a light, floral roast called Mexican Chiapas. The smooth and full-bodied Big Blend of Texas contains a combination of Guatemala Maya Ixil and Bolivia Caranavi coffees with chocolate notes. As I made the long drive home to Austin, the scent from my bag of coffee filled the car. That alone made me glad I picked it up as a souvenir, but drinking a cup of it every morning has proven even better.